The news has been busier than usual with stellar phenomena the past 24 hours with the report of a solar flare heading right for us. These flares are full of solar plasma that hit our magnetosphere and excite molecules in our upper atmosphere, producing long bands of mostly greens and reds (sometimes blues, depending on the altitude) we know as aurora. Reports have also been coming in that aurora have been brighter and farther south than usual in the last 12 hours, meaning we *might* be in for a show tonight if the CNY skies are clear enough. Physics! the Sun-Earth connection, with a flare to boot. From universetoday.com. All that said, while the fact that “aurora will occur” is reasonably easy to predict based on the known direction of a solar flare, the overall brightness, timing, and the final observable latitudes are not easy to predict (we’re talking meteorological accuracy here, folks). 1. Brightness – The beautiful pictures you often see of aurora are, like the high-quality deep space images from Hubble, not exactly what you’d see if you were there in person. The strong green and red colors in aurora images are often produced with longer-exposure photography using DSLR cameras. This means that, to see them best, you need to be away from lit locations where your eyes can adjust to dark surroundings to pick up that much more green and red. Those attempting to see aurora from Syracuse are more likely to confuse the bright parking lights from DestinyUSA and St. Joseph’s with aurora. Having all of the bright city lights to your South IS THE KEY – so consider driving as far North as you believe to be reasonable to improve your chances of seeing aurora. 2. 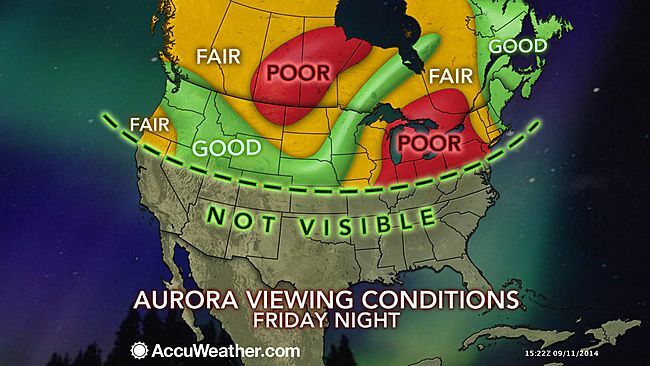 Timing – There were reports of aurora in Arizona last night. Arizona. That’s quite a ways South! That, unfortunately, can mean bad news for CNY observing. 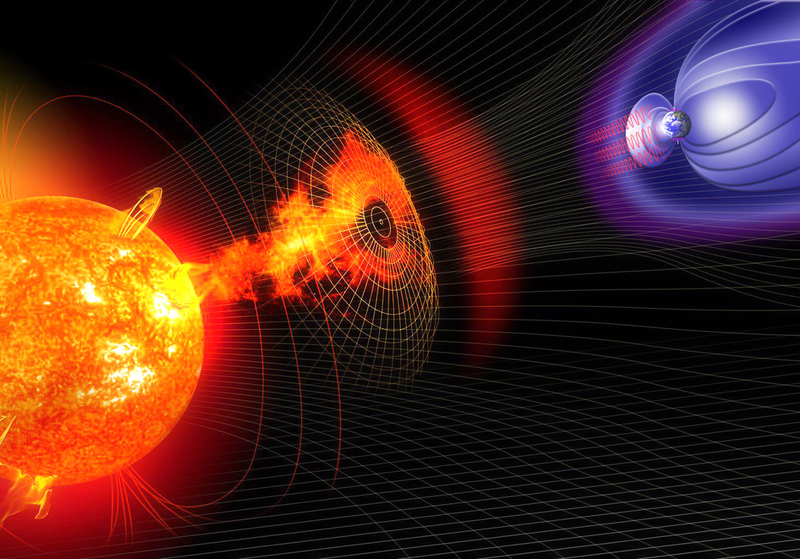 Solar flares are not continuous streams of plasma from the Sun – you can think of them more like a fireball. That is, there’ll be a little bit of heat (aurora activity) when the front edge of the fireball interacts with our magnetosphere, then the aurora will really brighten when the core of the fireball (and the most plasma) interacts with our magnetosphere, then the fireball will taper off and the aurora will dim. The fact that aurora were visible in Arizona last night might mean that a strong piece of the front edge (hopefully not the core, but that remains to be seen) had just hit Earth, which might mean the greatest intensity might occur during our afternoon and early evening tonight – which means we won’t see any activity (because the Sun is filling our sky with scattered blue photons). It is tough to know if we’ll still be in the throes of high activity or not until we see it tonight. 3. Latitude – For the most part, aurora are localized to a band around 15 degrees away from Earth’s geomagnetic poles, placing the peak of this phenomena usually in the Arctic (and Antarctic, let’s not forget!) zone – which is why most of the really good aurora pictures you see reveal a considerable amount of snow and ice on the ground (also made possible by the long exposures of the DSLR cameras). 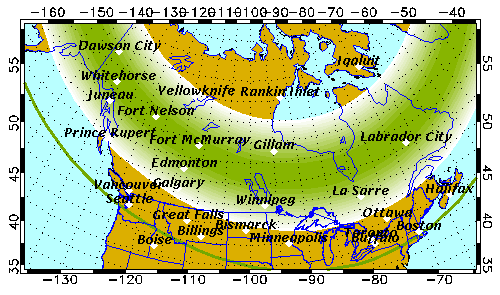 When large flares hammer on Earth’s magnetosphere, this peak region can slide in the direction of the equator, making aurora visible to more of Canada and the US. At peak hammering, we can see aurora in CNY no problem. But, again, timing and location are everything in this case – if the timing is just right, you’re still likely better off driving North for better views. Geophysical Institute, University of Alaska Fairbanks – When you google “aurora prediction,” this is the first site you get. That should tell you something about how much others trust it. Most of the images you might see in local news reports likely come from this website. To use this site, click on THIS LINK, then scroll down on your left-hand side to the “Select a Map” box, then click on the North America map. You’ll get an estimate of the likelihood of seeing aurora for our area, then more detail about timings and what it is that’s causing the specific aurora (Click HERE for tonight’s updates). Aurorasaurus – A site that absolutely needs to be used by more people. This is a crowdsource’d aurora alert system, where you can see if others in your area are reporting aurora or YOU can report seeing aurora to coax someone else outside. The site will get more interesting for CNY as we approach evening, but I would give this site a good look tonight to see if anyone else in our area is having good luck to the North. Syracuse.com – Glenn Coin already gave us one update this morning and I suspect updates will follow as prime observing time approaches and we (scientists and citizens together) have more to say about what is or isn’t visible. So, keep track of your favorite local news sources – or be the news source and report to them if you end up seeing anything!